Whilst we were busy with the show, Nordhavn 60/52 “Relish” was making her way up from Malaga. The trip was skippered by the well-regarded Ted Duff who has successfully delivered several other Nordhavn’s for us along with two other crew members. She made the trip to Hamble within 7 days and upon her arrival, Ted reported how superbly she ran reaching speeds of up to 13.5kts through the Alderney race. Now in Hamble “Relish” will be our latest brokerage listing, details of which will be published very soon! She is a fantastic example of a well-equipped and beautifully maintained Nordhavn 60. ‘Relish’ safely moored up upon her arrival in Hamble. In October we will see the arrival of “Zembra” the largest Nordhavn to berth at our European office. She is a Nordhavn 86 on-route from Greece. “Zembra” will be staying with us for a short period of time whilst we carry out seasonal service work before continuing her cruise to Germany. In October we also have the shipping of a new build Nordhavn 63 hull 15 from our builder South coast marine in Xiamen, China. 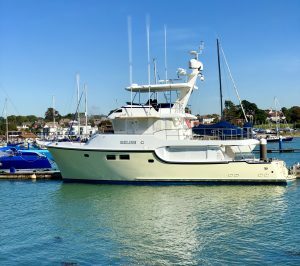 We anticipate her arrival into Hamble mid-November where she will remain whilst undergoing commissioning from our team before hand-over to her eagerly awaiting new owners. The final week of October will see Philip Roach fly over to Fort Lauderdale for the big show debut of our much-anticipated 59CP along with a fantastic 76. The show will run from the 31st of October until the 4th of November. If you would like to meet up with Philip at the show then please get in touch.